If you’re up for a very full day trip from Porto, Portugal then consider adding a visit to the town of Lamego after Guimarães. After our visit to Guimarães Castle and the Ducal Palace, we continued on to Lamego, which is 119 km (74 miles) east from Guimarães. This drive is quite pretty, winding through the hills and valleys of the Douro Valley, the great wine producing region of Portugal. Our primary reason to visit Lamego was to see the Santuário de Nossa Senhora dos Remédios (Our Lady of the Remedies), an 18th century Baroque church which sits on St. Stephen’s Hill (a pilgrimage site), with a fine view of Lamego. This church is on one of the routes pilgrims have taken when traveling to Santiago de Compostela in northwestern Spain. It is known for its beautiful stairways and decorative landings leading up to the church itself. View of Lamego from the Santuário de Nossa Senhora dos Remédios. Interior view of the Santuário de Nossa Senhora dos Remédios. One of the nine landings and some of the 686 steps which climb St. Stephen’s Hill to the Santuário de Nossa Senhora dos Remédios. Many of the landings have beautiful tile artwork. A view of the stairs and landings leading up to the Santuário de Nossa Senhora dos Remédios. Each September, as part of the Festa de Nossa Senhora dos Remédios, some pilgrims will climb the stairs on their knees. In addition to the Santuário de Nossa Senhora dos Remédios, Lamego has an interesting and very historic Cathedral, which dates from the mid 12th century. It is located in the heart of the town, a short distance from the bottom of St. Stephen’s Hill. Its construction was commissioned by the 1st king of Portugal (Afonso Henriques). A view of the Lamego Cathedral. The bell tower on the right dates from the early 1100’s. 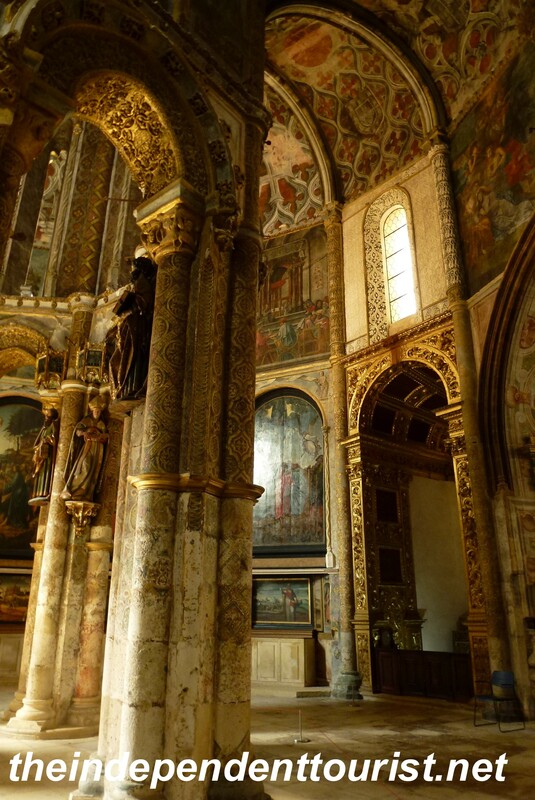 Interior of the Lamego Cathedral. 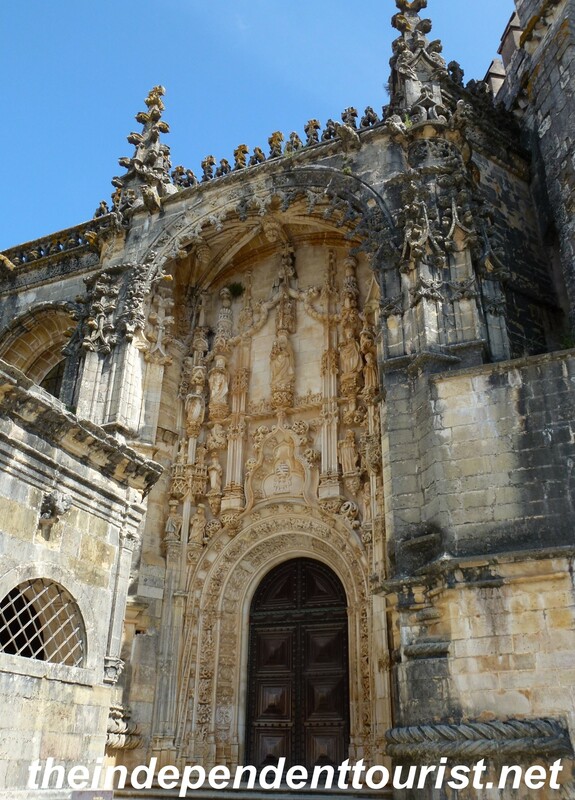 The decorative door portals on the Lamego Cathedral were completed in 1514. A closer look at the 12th century bell tower of the Lamego Cathedral, which also served as a prison starting in the 1400’s. Another gem in Lamego is the Chapel of São Pedro de Balsemão (Chapel of St. Peter). This ancient chapel (which dates to 600 CE) is a bit hard to find–it sits below the main town in a little narrow valley, but we managed to find it. Exterior view of the Chapel of São Pedro de Balsemão, which belies its 1500 year-old interior. Interior of the Chapel of São Pedro de Balsemão. Stones from a nearby Roman Villa were used in its construction (the tomb is from the 14th century, a Bishop of Porto). This statue of Mary, found in the Chapel of São Pedro de Balsemão, was sculpted from white limestone in the 14th century. On the fastest car route from Guimarães to Lamego lies the town of Vila Real. This town is home to the scenic 18th century Mateus Palace. This palace is privately managed and is quite pricey to visit, so we stopped only for a quick walk in the gardens and to view the exterior of the palace. It was a worthwhile stop. A postcard view of Mateus Palace. Exterior view of the chapel of Mateus Palace. View of the neatly manicured gardens of the Mateus Palace (the palace chapel is in the background). A little fountain and statue in the gardens of Mateus Palace. Another view of the gardens and surrounding countryside of Mateus Palace with my wife and mother-in-law. This little town and castle is in a completely different direction from Porto than the sights mentioned above. Santa Maria da Feira is directly south of Porto about 32 km (20 miles). The reason to visit this town is for its historic castle, which although small, is pretty classic-looking and worth a visit. There has been a fortress on this spot since the 10th century, it was a strategic stronghold for the reconquest of the Iberian peninsula from the Moors. The current castle dates from the 1400’s. Exterior view of the Santa Maria da Feira Castle. Another view of the castle from the side opposite the first photo. The roof of the castle – my mother-in-law in one of the castle’s towers. View of the town of Santa Maria da Feira from the castle roof. During our visit to the castle, they were setting up for a Halloween party, what better place than an actual medieval castle! Posted in Portugal and tagged Lamego portugal, Portugal Travel, Things to see in Portugal, Visiting Portugal, What to do in Porto Portugal on March 6, 2018 by Paul Terry. For a pleasant day trip from Porto, Portugal, try Guimarães. This town is about 55km (34 miles) northeast of Porto. Guimarães is considered the birthplace of Portugal. Although Portuguese dukes declared independence from this location as far back as the 12th century, true independence would not happen until the 17th century. As with many cities in Europe, the history of Guimarães dates back to ancient times, at least to the Roman period. The site of the castle and palace, called Holy Hill, is steeped in history too. I always love when several historic buildings are part of the same property. This little chapel, Church of São Miguel do Castelo (near Guimarães Castle), dates back to the 10th century (unfortunately it is not open for visitors). The castle and palace described below are next door to each other and near the town center. This castle is very small, mainly a crenelated wall with eight towers and a small tower keep in the center. In spite of being small, it is a national symbol of Portugal’s founding and struggle for independence. Interesting to see how the existing huge rocks were incorporated into the castle walls. The tower keep at Guimarães Castle also incorporates the original hillside stone. You can partially walk around the castle walls, which provide a good view of the palace and surrounding countryside. View of the Ducal Palace from Guimarães Castle. A view of the wall walk and a tower at Guimarães Castle. The best views of the castle are from the exterior. It was built originally in the 10th century to protect against the Norsemen and Moorish invaders. Exterior view of Guimaraes Castle. The palace is more interesting than the castle, with a large interior courtyard and rooms that make you feel like you’ve been transported right back to the 1400’s. The style is reminiscent of French architecture, and the whole palace looks like it belongs in Northern Europe. Exterior view of the Ducal Palace of Braganza. 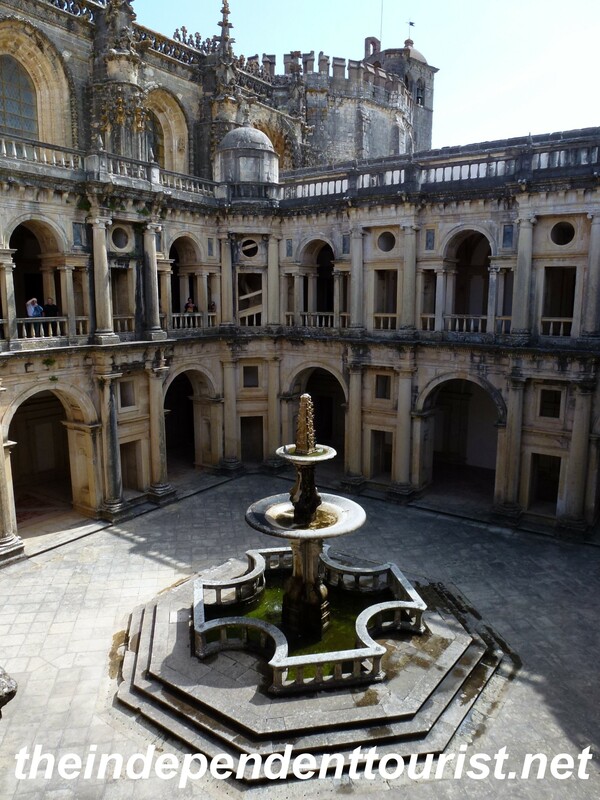 Courtyard of the Ducal Palace of Braganza. Another exterior view of the Ducal Palace of Braganza. Great tapestries hang from the huge room walls, and the furniture fits the palace’s original period pretty well. A hall in the Ducal Palace of Braganza, with massive tapestries. Construction began in the early 15th century, as ordered by the Alfonso, Duke of Braganza. Another hall in the Ducal Palace of Braganza. Room in the Ducal Palace of Braganza. The chapel in the Ducal Palace of Braganza. The palace has been reconstructed over the years and served as a residence for the President of Portugal in the mid 20th century. This little square is next to the castle and palace. It has a statue of Dom Afonso Henriques, who was born in Guimarães and was the first king of Portugal (12th century). (Parking was available on the street right by the square). In addition to the castle and palace, Guimarães has a quaint town center and a convent (Misericórdia), which we did not take the time to visit, since we wanted also to visit a few sights near Lumego on the same day. Lumego is 119 km (74 miles) east of Guimarães. Posted in Portugal and tagged Ducal Palace of Braganza, Guimaraes Castle, Guimaraes Portugal, Portugal Travel, Sights near Porto, Things to see in Portugal on February 18, 2018 by Paul Terry. Porto is one of the smaller great cities of Europe and slightly off the tourist radar, perhaps because it’s a bit isolated at the northwestern end of the Iberian peninsula. I think it’s a more interesting city than Lisbon, although it shares some similar physical characteristics, such as being located on a river and close to the Atlantic Ocean. We spent a couple days in Porto, visiting sights in the city and the surrounding area. I’ve listed below a few things to see in Porto. In my next blog post I will cover some of the surrounding area. Interior of the Porto S. Bento Train Station – art work is everywhere you go in Porto. Be warned, Porto is a hilly town and you will get your exercise walking up and down the city streets! One of the many narrow streets in Porto. The Douro River is a major feature of Porto, dividing the city into two halves – north and south. The river is a transportation hub and much of Porto’s restaurant scene and nightlife centers on the river front. After arriving in Porto and getting settled in our apartment, we strolled down to the waterfront and chose one of several available river cruises for the evening. The cruise was about an hour long. It’s a great way to get a feel for the city and life along the waterfront. A typical river cruise boat on the Douro Rive (part of Porto’s old city wall is visible on the hillside). A view of Porto’s river waterfront, looking north. Porto’s cathedral sits above and behind the construction crane. One more view of Porto’s riverfront, note all the little booths selling food and trinkets along the bank. A beautiful sunset frames the famed Dom Luís I Bridge which crosses the Douro River in the heart of Porto, connecting the north and south sides of the city. Close to the Dom Luís I Bridge on the north side of the river are many restaurants. Just across the river on the south side are the famed Porto wine cellars. Admittedly, it’s a little touristy around here, but there’s a fun ambiance and it’s a great place to spend an evening. Near the Douro River, restaurants get set for another evening of busy service. There are a number of beautiful churches in Porto, many of which date from the early – mid 1700’s. They are easy to spot with their blue decorative tile exteriors. With our tourist map in hand, we explored about a half dozen churches, a few of those are shown below. Straight ahead is the Igreja dos Congregados, one of the many decorated churches in Porto (S. Bento train station is on the right). Exterior of Igreja de Sto Ildefonso. Many of the churches from the early 18th century have beautiful tile work on the exterior. Side view of the Igreja do Carmo, another 18th century church in Porto. The somber exterior of Igreja de San Francisco (which dates from the 14th century), does not give any clue as to what awaits the visitor inside. Interior of Igreja de San Francisco, with some of the most ornate Baroque decorative woodwork I’ve seen in a church anywhere. A close-up of one of the altars in Igreja de San Francisco. Exterior of the Irgreja e Torre dos Clergios, which also dates from the early 18th century. The church and tower, as the name implies, are connected and both are well worth a visit. Interior of the Igreja e Torre dos Clérigos. A view of the Torre dos Clerigos, which dominates the Porto skyline. It can be climbed for great views of Porto. View from the Torre dos Clerigos. The 12th century cathedral is in the center of the old town. The Porto Cathedral, which dates from the latter half of the 12th century. Interior of the Porto Cathedral. View of a portico of the Cathedral, with decorative tiles that were added in the 17th century. The Dom Luís I Bridge connects north and south Porto and was built in the late 1800’s. One of the bidders on the project was none other than Gustave Eiffel, of Eiffel Tower fame, although he did not get the job. This bridge is the signature landmark of Porto and dominates the riverfront views of the old city. A view of the Dom Luís I Bridge and Douro River, looking to the old part of Porto, on the north bank. The bridge can be walked on either the upper or the lower level. The upper level provides great views of the city for the pedestrian (and carries trains across the river), cars use the lower level as well as pedestrians. A night view of the Dom Luís I Bridge, looking south. The building behind the bridge is the Serra do Pilar Monastery. The Livraria Vello bookstore is another famous landmark of Porto. It dates back to the late 1800’s, and is one of the oldest bookstores in Portugal and is considered one of the top three bookstores in the world. I’ve read that it served as inspiration for the Harry Potter books, as the author lived in Porto for a period of time and spent time here before writing the famous story. Inside the Livraria Lello Bookstore, 2nd level. The famed staircase inside the Livraria Lello. Another view of the Livraria Lello Bookstore. Due to the store’s popularity, you have to get a ticket to visit the bookstore at a specific time, these can be purchased online. Also nearby is a fun gift shop with a whole variety of nicknacks. As usual, Robyn found us a great place to stay in Porto, an apartment right in the old city on the north side of the river and close to all the sights. Robyn on the balcony of our apartment in Porto, which was a 5-10 minute walk to the riverfront. The kitchen of our apartment in Porto. Looking out on the street from our apartment in Porto. Posted in Portugal and tagged Dom Luis I Bridge, Douro River, Porto Portugal, Portugal Travel, Things to see in Portugal, Visiting Portugal, What to do in Porto Portugal on February 10, 2018 by Paul Terry. Our last stop between Nazaré and Porto was Coimbra, home to one of Europe’s oldest universities and the former capital of Portugal. The university was founded in Lisbon in 1290, moved to Coimbra, then moved back to Lisbon and finally back to Coimbra for good in 1537. The university has an ideal setting–it makes its home in the Alcaçova Palace, which sits on a hill in the old quarter of Coimbra overlooking the Mondego river. About 20,000 students attend the university from all over the world. A view of Coimbra from the Alcaçova Palace. A view of Coimbra University buildings and the Mondego River in the distance. Joanine Library. This 18th century library is the star tourist attraction of the university, and it is stunning. The library contains 250,000 volumes dating from the 15th century. Great care is taken to maintain an environment needed to preserve the old texts, including the housing of a small colony of bats that prey on the paper-eating insects that could destroy the books. Of course, cleaning up after the bats every day is no small challenge! A view inside the Joanine Library. Another snapshot of the library, showing the table where old texts may be read. Note: The rules state very clearly as you enter the library that no photos are allowed and they are serious about this. I took a few photos (above) on my phone and shortly thereafter I was quickly ushered out of the library. So, be warned! Also a ticket is required for entry to the library, and you are given a specific time to enter, with perhaps 10-15 other people. São Miguel Chapel. This chapel was built in the early 1500’s and is quite beautiful with decorative tiles and a grand organ dating from 1733. The chapel is sometimes rented out for weddings and other events. The altar in the São Miguel Chapel. 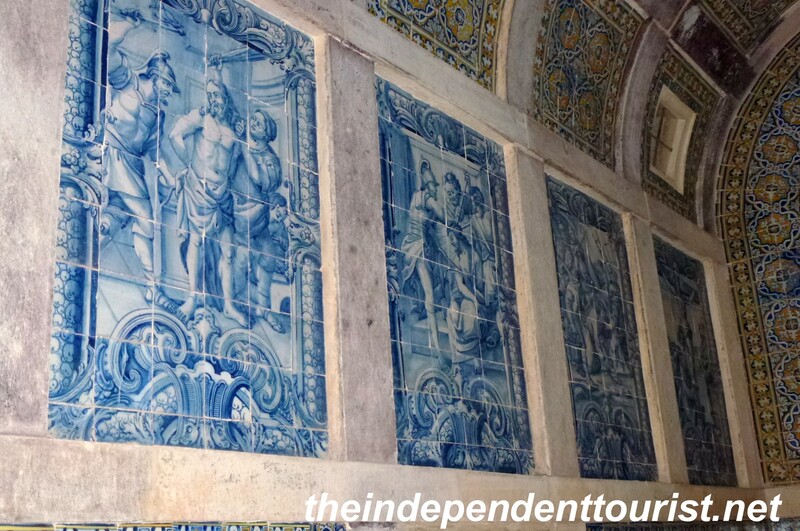 A view of the tile work in the São Miguel Chapel. The 18th century organ in the São Miguel Chapel. Alcaçova Palace. Since Coimbra University occupies the buildings of a former palace, a few other rooms are open to tourists, most contain displays of local history. Courtyard and grand hall of Alcáçova Palace, home of Coimbra University. The grand hall of Alcaçova Palace where doctoral students defend their dissertations. Spear display in Alcaçova Palace. Outside the university in the Old Quarter of Coimbra, we made just one other stop, to visit the “New” Cathedral (Sé Nova). This cathedral, built in 1598 is not exactly new, but relative to the old cathedral, known as Sé Velha (from the 12th century), I guess we can consider it new! 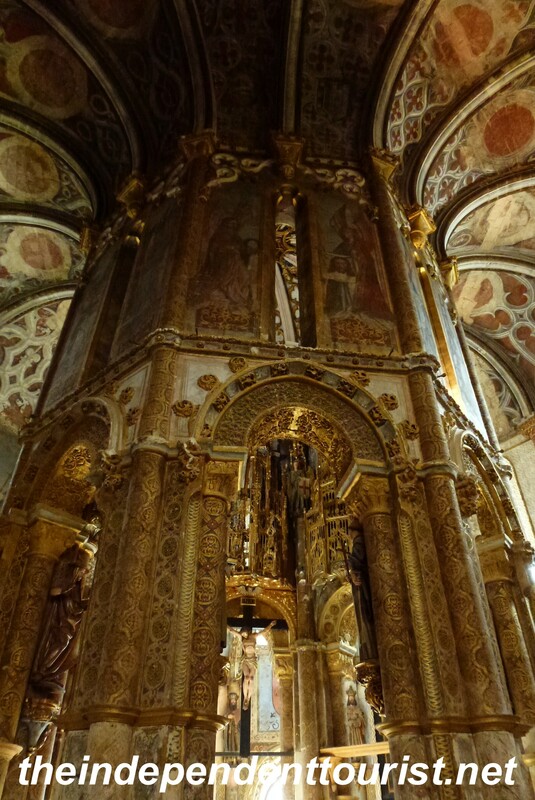 The altar in the Sé Nova de Coimbra. Chapel in Sé Nova, Coimbra. If you’re on your way to Porto, the town of Coimbra is definitely worth a stop. I wish we had had more time to explore this old city. Posted in Portugal and tagged Coimbra University Portugal, Portugal Travel, Sights near Porto, Things to see in Portugal, Visiting Portugal on January 23, 2018 by Paul Terry. On our way north from Nazaré to Porto we stopped at the site of a Roman settlement in Portugal, known as Conimbriga, which is about halfway between those two cities (roughly 110 km or 68 miles either way). The history of Conimbriga actually dates back well before the Romans, to the Bronze and Iron ages. It was an ideal location, on a plateau that was easy to defend and good access to water. What remains are the Roman-era ruins, of which 17% have been excavated, leaving a lot more to discover. The visible ruins date from about mid 1st century CE to about 500 CE, when the Roman empire finally completely collapsed. Although most of the structures are pretty ruined, enough remains to get a feel for the wealth and prosperity of Conimbriga in its prime. The gate and road into Conimbriga. The original city walls were smaller and encircled a much wider area. The town’s fortifications were strengthened around a smaller portion of the city in the 3rd century CE. These structures, which include shops, baths and houses, are just outside the town’s walls, which form the backdrop. The largest aristocratic residence, known as the House of Fountains, sits just outside the walls. It was constructed around 200 CE and excavated in 1939. It has a huge courtyard (or peristyle) with pools, fountains and beautiful mosaic floors in its rooms. Unfortunately, it was largely demolished when the defenses of the town were strengthened and building material was needed. The remnants of this 35,000 sq. feet residence are still interesting, protected by an overhead shelter. The courtyard of the House of the Fountains, with its pools and small fountains. It must have been very impressive 2,000 years ago. Note the mosaic floors around the perimeter of the pools. A view of some of the rooms in the House of the Fountains. A closer look at the frescoes and mosaic floors in the House of the Fountains. There are remains of other buildings inside the city walls, including a forum, basilica, and other dwellings. The Romans were amazing engineers and builders, their ability to construct a city layout with infrastructure that is still partially intact today speaks to their skills. This structure is known as the House of Cantaber, constructed about 100 CE. The columns surround the peristyle (courtyard). The city walls are right behind the house. A view of private baths at Conimbriga, the foundations here date from the 3rd and 4th century. The hexagonal tanks were heated and held hot water. Another view of the ruins of Conimbriga. The remains of the Baths of the Aqueduct (the wall behind the raised floor was the aqueduct, and the raised floor covers part of the baths). In addition to the ruins at Conimbriga, there is a small museum on the site, and there are a few other small Roman ruins north and south (Alcabideque, Rabaçal and Santiago Da Guardia), indicating the expanse of Roman civilization in this part of Portugal. Posted in Portugal and tagged Conimbriga, Portugal Travel, Roman ruins in Portugal, Things to see in Portugal, Visiting Portugal on January 14, 2018 by Paul Terry. Portugal is home to some of the most famous medieval-era monasteries in Europe. On our last trip, we were able to visit four of them. A primary reason for our two day stay in Nazaré was to visit three of these monasteries: Alcobaça, Batalha and Tomar (the fourth monastery is in Belém, near Lisbon, I have written a little about it here). It might be possible to visit all three in an extremely rushed day; however, I would suggest visiting Alcobaça and Batalha on one day (both are pretty close to Nazaré) and then see Tomar on the second day, with a visit to Almourol castle before or after (these two sights are just 32 km (20 miles) apart). All three monasteries in this post are well worth visiting. For sake of time, I would prioritize Tomar first (it’s the furthest away and has the most extensive set of rooms that can be visited), Alcobaça and then Batalha. The town of Tomar, known for its unique monastery (called Convento de Cristo), is one of the signature sights in Portugal. The main chapel dates to the 11th century and the walls surround the monastery complex are much older. Convento de Cristo is extremely unique because of its circular, fortress-like chapel, and its long association with the Templar Knights. A view of the walls surrounding Convento de Cristo in Tomar. 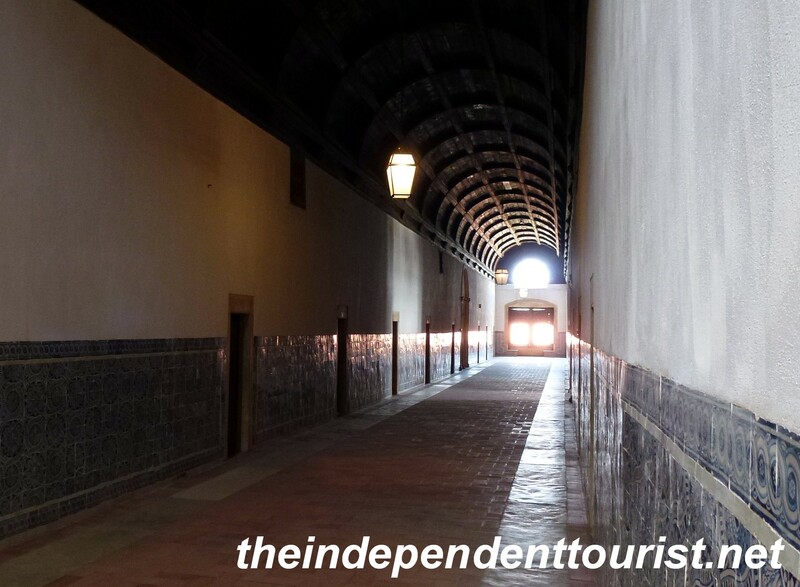 I had the privilege of visiting Convento de Cristo a few years ago, and I was just as amazed visiting it again on this trip as I had been previously. The site is extensive, and consists of visiting the chapel, cloisters with several levels, kitchens, refectory, dorm rooms, meeting halls and other places, including the exterior gardens. The circular (16 sided) Templar chapel of Convento de Cristo. 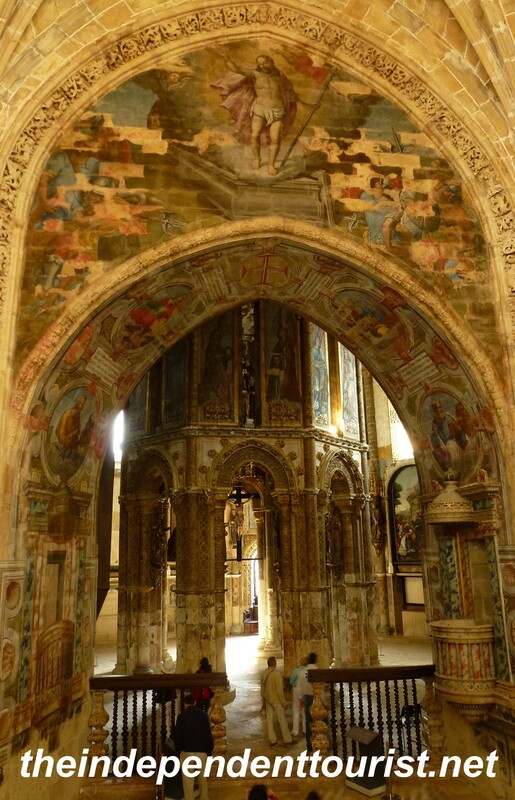 Interior of the Templar Chapel (Charola), Convento de Cristo. The elaborate entrance to Convento de Cristo, Tomar. 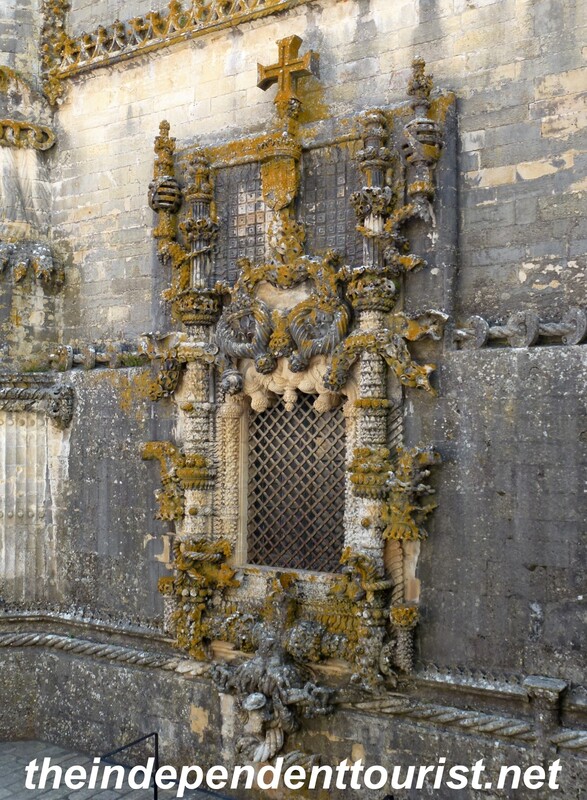 Detail of the Manueline sculptures (16th century) which decorate the Convento de Cristo. Allow at least two hours for your visit. The site is well sign-posted with English explanations. 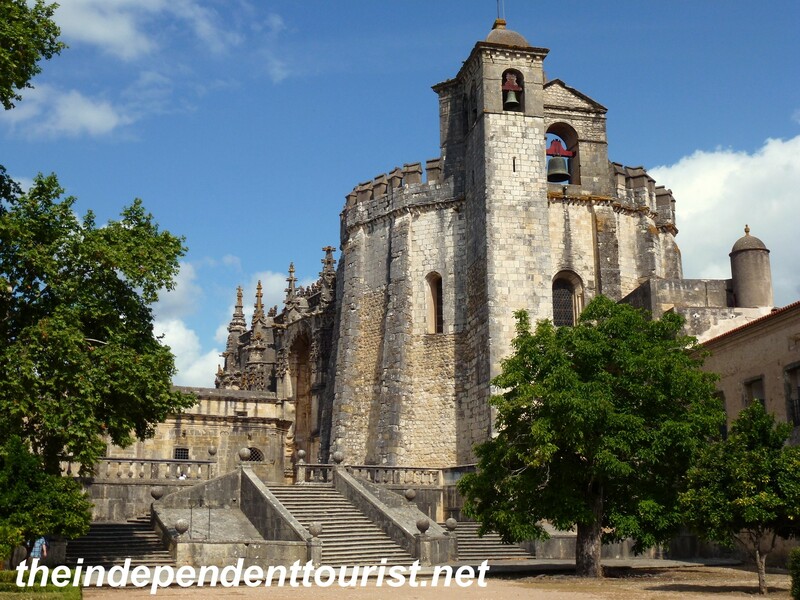 Note: Several years ago, I visited Tomar as a day trip via train from Lisbon (see post here). This is very doable. However, if you have more time, a road trip is better, since you will be able to see more sights along the way. Since my family had not been to Tomar, we made this sight one of our destinations out of Nazaré. It’s only 77 km (48 miles) directly east of Nazaré. This monastery sits on a hill overlooking the town, and parking is available off the road part way up the hill. Also, just north of the town of Tomar a few kilometers is an old aqueduct, built in the 1590’s. Visiting it is free, it goes right over and next to the road. We saw it on the map and made our way to it after our visit to the monastery. It was built to provide water to the monastery. A view of the aqueduct near Tomar. You can take a walk across the top. This Cistercian monastery is just 16 km (10 miles) east of Nazaré and takes its name from its location at the confluence of the Alcoa and Baça rivers, which provided a water source for crops and the monastery residents. Construction began in 1178 and now the monastery is surrounded by the old town of Alcobaça. Exterior view of Alcobaça monastery. A view of the Cloister of Silence, built in the 13th century. The massive and austere interior of Alcobaça Church. The vaults are over 20 meters (65 ft) high. Alcobaça’s refectory (where the monks would eat their meals). From this pulpit, there would be scripture readings to those gathered. Everything in Alcobaça is on a huge scale. This is a view of the massive kitchen. Reliquary Chapel, built between 1669 – 1672, part of the Manueline Sacristy. There is an additional fee to visit this chapel, but it is well worth it. Seventy-one terra cotta busts adorn the interior. The dormitory, one of the oldest parts of the monastery. The adjacent town of Alcobaça also deserves at least a short walk, it has a scenic center. A view of Alcobaça town. Founded in 1386 by King João I (who is buried here), to commemorate a battle that led to Portugal’s independence from Spain, this site is of national importance to the Portuguese. Construction went on for hundreds of years and was never completed. This monastery is 32 km (20 miles) northeast of Nazaré. It is considered one of the finest manifestations of gothic architecture in Portugal. This monastery was nearly in ruins in the early 1800’s, and thankfully it has been restored and is now a museum. A view of the north side of Batalha Monastery. Another view of the exterior of Batalha Monastery. The intricate detail carvings over the entrance to the unfinished chapels (Capelas Imperfeitas) at Batalha. A view of the unfinished chapels. The soaring expanse of the main nave in the church at Batalha. Door carving at the entrance to the cloisters. A view of the cloisters at Batalha. The Chapter House at Batalha. Its ceiling covers a large expanse and has no central support, an engineering feat in the early 1400’s. Soldiers can be seen standing as honor guards in this room by the far wall, stationed here in remembrance of the war of independence from Spain. We visited these monasteries in October, and none were very busy. You can get a ticket that allows you to visit all three of those discussed in this post for a discounted rate. A senior rate is also available. Buy your ticket at the first monastery you visit. There is a direct train to Tomar from Lisbon (I recall that there were only one or two stops along the way), and it’s an easy day trip from Lisbon. Travel to Batalha and Alcobaça is a bit more complicated from Lisbon via train (it requires bus travel too). A rental car is by far more convenient. Posted in Portugal and tagged Alcobaca, Batalha, Monasteries in Portugal, Portugal Travel, Things to see in Portugal, Tomar, Visiting Portugal on January 3, 2018 by Paul Terry. From Sintra, we drove north to our next destination, Nazaré, a town on the central coast of Portugal. We chose Nazaré as our base for exploring this region of the country due to its location, choice of hotels and natural beauty. Since there is much to see in this part of Portugal, I will cover some sights in this post and others in Part II. This scenic, small medieval castle sits on a rocky outcrop in the Tagus River, the same river which flows through Lisbon. A view of the castle from our small boat. The castle is located 110 km (68 miles) east of Nazaré. Not much is really known about the castle’s history, but it was likely built prior to the Christian conquest of the Iberian Peninsula in 1129. The Knights Templar had stewardship of the castle and surrounding lands until their disbanding in the 1300’s. The massive walls of the castle. To reach the castle, you have to take a small boat, and you are given about 45 minutes to visit the castle before the boat returns to the mainland. The castle is in a rural area–there is a small snack shop near the parking lot, but not many restaurants around. Also, the boat operator takes a 1.5 hour lunch break, so plan your visit accordingly. This town would be another good base for visiting central Portugal (it’s just 37 km northeast of Nazaré). Even though Leiria is surrounded by many tourist sights, the town itself is not on the tourist map, but is still worth a stop. Sitting on a prominent hilltop overlooking the town is an old castle (which was turned into a palace). Leiria’s town square with its castle on the hilltop. The town square below (known as Praça Rodrigues Lobo) has a nice view of the castle. The town also has some quaint streets, a cathedral, an old 15th century paper mill and a little 11th century church (near the castle). Just 15 minutes south of Leiria is the stunning monastery of Batalha, which I will cover in Part II. 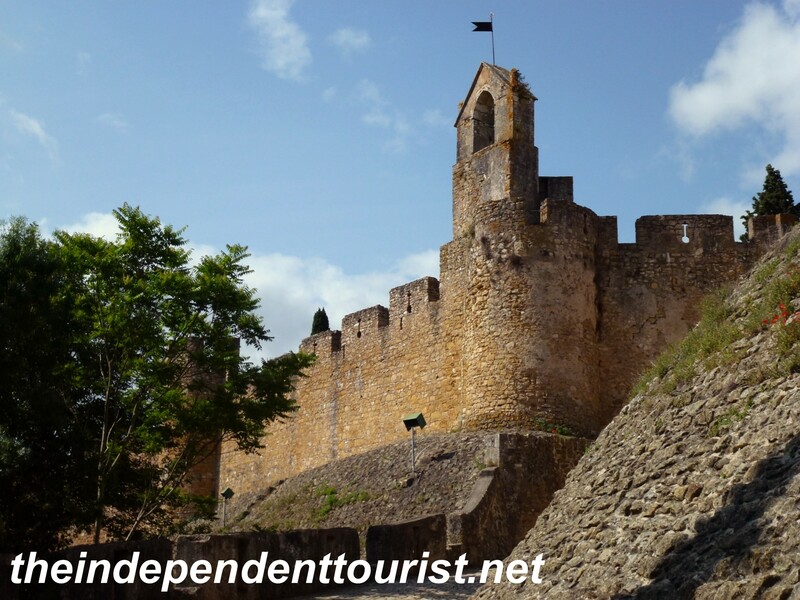 About 40 km south of Nazaré is Obidos, a medieval town encircled by a high wall. At the south end of the old town is a beautiful gate and at the north end is an old castle watching over the town and surrounding countryside. At the north end of of the old town of Obidos with its castle. Main Gate, Obidos. A 14th century gate, with 18th century tile work. You can walk on the walls around the whole town for free. One of the entrances to the wall by the castle. On our walk around the walls of Obidos. We made it one half the way around the walls and then decided to do some shopping and have lunch in this magnificent setting. Obidos Town Square. There are several interesting old churches is the town. I would consider Obidos on the “must see” list in Portugal. Nazaré itself is an interesting town and was our home for a few nights as we explored the region. It is a fishing village and a summer destination for the Portuguese, given its good beaches and central location. Nazaré doesn’t really have a “surfing vibe” like spots in Southern California, but I understand it has some of the best waves found in the Atlantic Ocean. Looking down on the lower part of Nazaré with its wide expanse of beach. (The funicular tramway is in the lower part of the photo). The beach is wide and quite beautiful, but unfortunately, we were there in the fall time (October) and didn’t get to enjoy the water. The town is split into two distinct parts, with the lower part hugging the beach, and the oldest part of the town sitting on a bluff overlooking the ocean, lower town and beaches. Old Town Square, “upper” Nazaré. Lots of good restaurants down by the beach. We stayed at the Hotel Magic, a great boutique hotel in the lower town. The lower part of Nazaré has a nice promenade along the beach. In my next post, I will cover our visits to the world famous Alcobaca, Bathala and Tomar monasteries. Posted in Portugal and tagged Almourol Castle Portugal, Obidos Castle Porgual, Portugal Travel, Sights in central Portugal, Sights in Portugal, Visiting Portugal on November 3, 2017 by Paul Terry. A view of the Palacio Nacional de la Pena from the Moorish Castle. 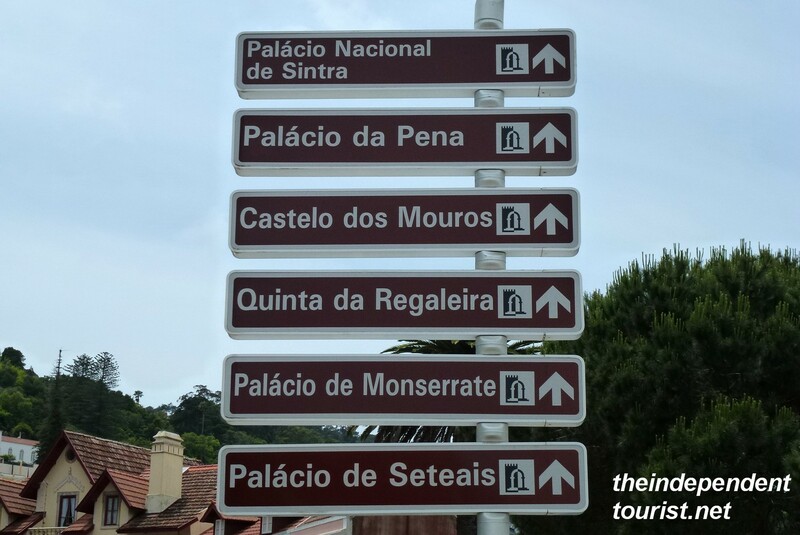 Sign listing all the sights in Sintra. Other options to visit are discussed below. Sintra has been the playground of royalty and the rich and famous for centuries, hence the collection of very interesting and unique sights here. On the Moorish castle ramparts. Another of the defensive towers at the Moorish Castle (Atlantic Ocean in the distance). A view of Sintra and beyond (looking northeast) from the castle walls. 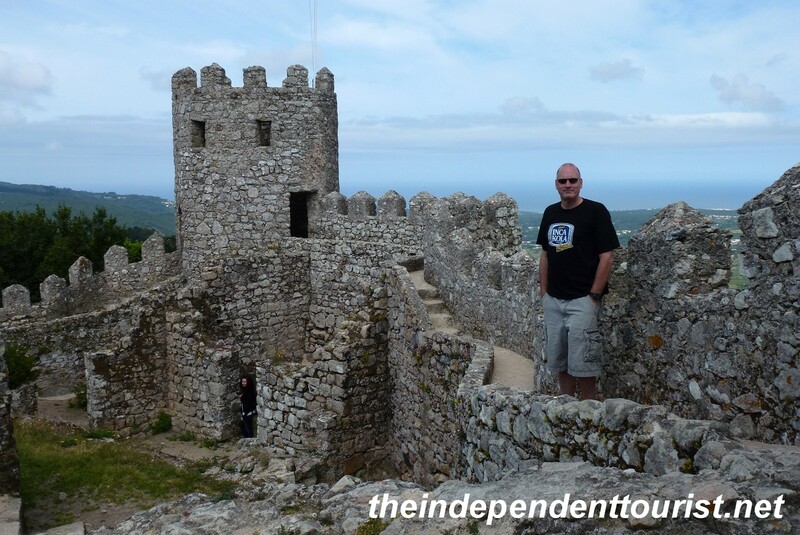 The ruins (9th century) have a commanding view of Sintra and out to the Atlantic Ocean. I recommend visiting here if for no other reason than for the views. There is not much left of an actual castle, but the defensive walls and towers have been restored and make for a great walk, with LOTS of stairways up and down the hilly terrain. Wear comfortable shoes and bring water. This structure looks like something out of Disneyland. It sits on the site of an old monastery built in 1503, which was later largely destroyed by earthquakes and lightning. View of the palace from the extensive wooded surroundings. Parts of the old monastery have been incorporated into the current structure which was built in 1844, as a romantic ideal of royal palaces—it’s a blend of Gothic, Moorish, Renaissance and Baroque influences, not unlike the fanciful Neuschwanstein castle in Bavaria. The reason to visit is mainly the interesting blend of architecture and less for the historical value. Another view of the interesting architectural styles at Pena Palace. Be forewarned, pictures are NOT allowed inside and cameras are everywhere. I didn’t notice the cameras and took a couple pictures, and then two seconds later a security guard was after me and made me delete the pictures off my camera. First time that’s ever happened to me. The extensive trails and grounds of the Palace are worth exploring, there are some good views of the Palace available from the wooded trails on the grounds. Palácio Nacional de Sintra: Home to the Portuguese monarchy for eight centuries. A lot of the visible artwork today was completed between 1505 and 1520. Looking down on Palácio Nacional de Sintra (middle right of picture) from the castle walls. 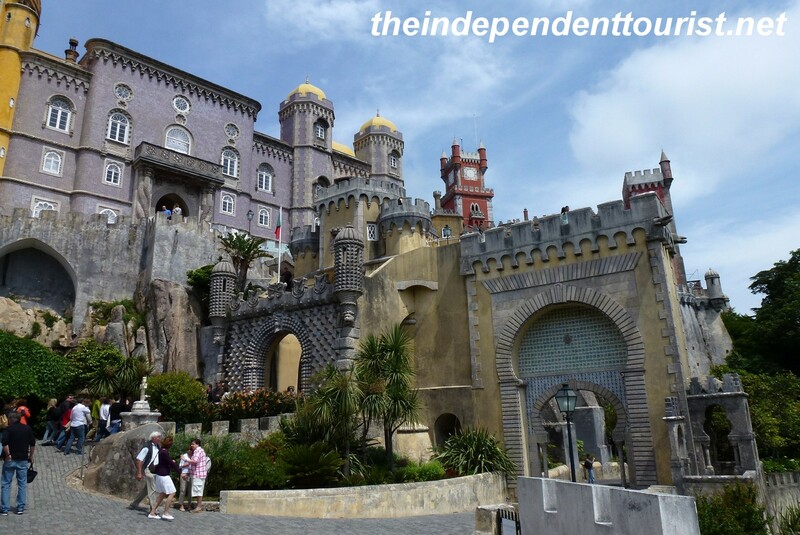 Palácio de Monserrate: Built on the ruins of a 16th century chapel and a neo-gothic palace and transformed in 1856 by a Brit, Francis Cook, this palace is heavily influenced by Moorish and Gothic architecture. There is an extensive botanical collection and beautiful gardens here. Quinta da Regaleira: A very weird palace, built in 1904, with lots of tunnels on the grounds and full of symbolism in the elaborate decorations. Convent of the Capuchos: A 16th century (dates to 1560) Franciscan hermitage, showing life as a friar with chapels, living areas, dormitories, and a library built into a hillside. The train to Sintra leaves from the Rossio Station in downtown Lisbon, right next to the Rossio plaza. The train makes a number of stops, but the journey still only takes about 45 minutes, and trains leave every 30 minutes. 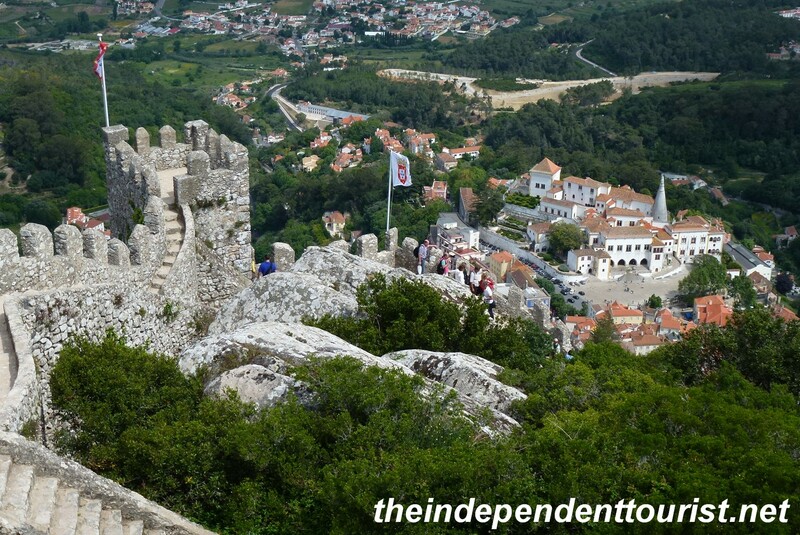 The historical center of Sintra is just a 5 minute walk from the train station. 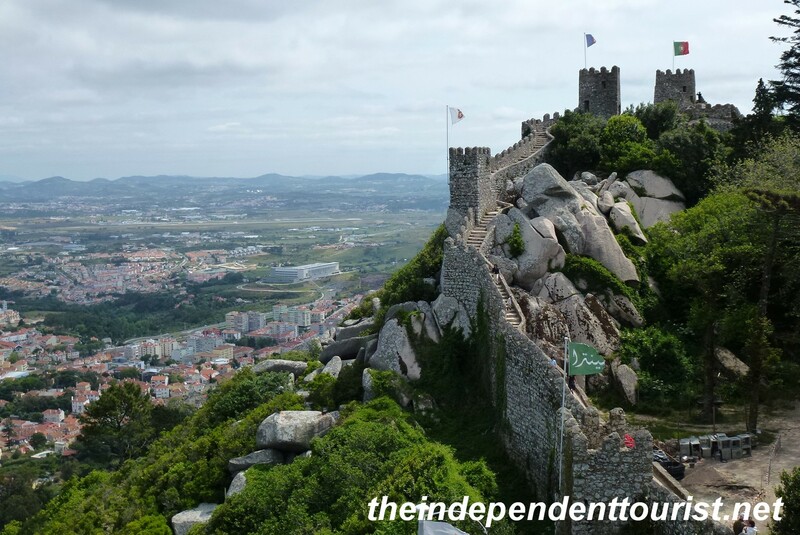 The sights are relatively close to one another; however Sintra is hilly and even after you arrive at a site by bus or taxi, there are some steep walks in front of you, at least up to and through the Castle ruins and around Pena Palace. Bus 434 will take you from the train station to Pena Palace. If you enjoy walking, take the bus up to Pena and walk back down to the town. You can get individual or combination tickets for the various sights. 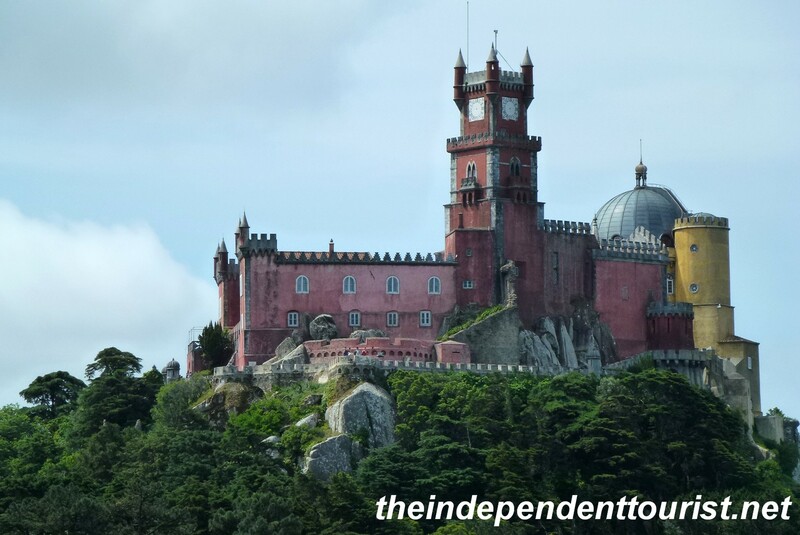 It cost €16 per person for the Moorish Castle and Palácio da Pena. 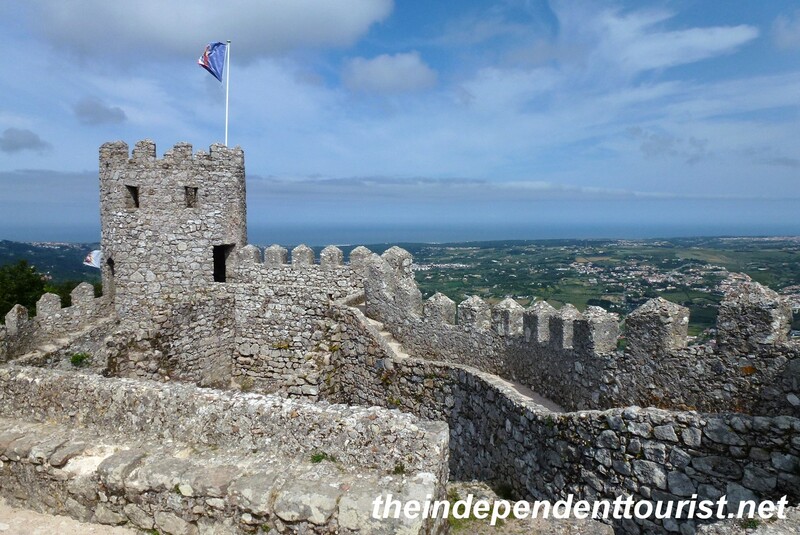 For more information on this area check out: http://www.parquesdesintra.pt. 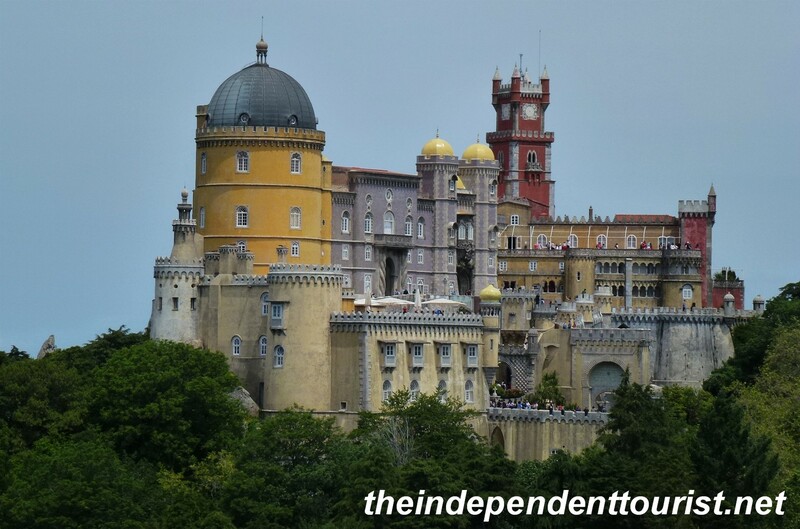 Posted in Portugal and tagged Pena Palace, Portugal Travel, Sintra, Things to see in Portugal on August 4, 2013 by Paul Terry. The Templar church (Oratory) was also a defensive tower, it has 16 sides, and was next to an exterior wall. The interior (see pictures below) is amazing. Huge fortress walls, a Templar castle-like church and a huge late-Gothic monastery all in one. What more could you ask for? That’s what you get with the Convento de Cristo, in the town of Tomar, Portugal. The entrace to the 12th century circular church from the 16th century chapter house. The circular ambulatory in the 12th century church. The 8 sided center column fans out to the 16 sided walls. The fortress grounds and convent sit on a hill overlooking the town of Tomar—the walls are visible from the train station. Ever since I got a book about the Great Monasteries of Europe (by Bernard Schütz) many years ago, I’ve wanted to visit Tomar. With my love of medieval history and interest in the Knights Templar, Tomar is a must do, and I finally had the chance to visit in 2012. 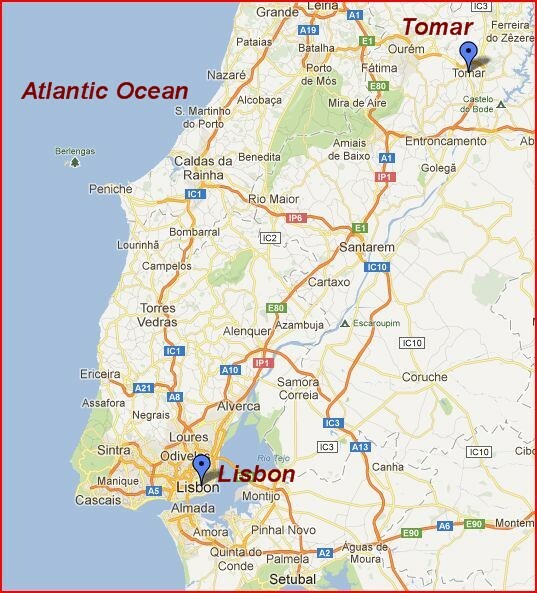 Tomar is 2 hours by train (137km) northeast of Lisbon. The fortified walls and entrance to the monastery. The original fortress was a Moorish settlement (9th to 12th centuries), and the Knights Templar made Tomar their headquarters in 1160. The Templars were heroes at the time due to their role in the Reconquista, helping push the Moors out of the Iberian Peninsula. The Knights brought with them architectural refinements from the Middle East (from their time defending the Holy Land) and the fortress structural design was considered ahead of its time for western Europe. The intricate carvings of the main entry way into the church and chapter house. The highly decorated exterior of the 16th century chapter house addition. The famous chpater house west facade window, 1510-1513, late Gothic “Manueline” style (after King Manuel), symbolizes the Tree of Life or Tree of Jesse from the Bible. When the Order of the Knights Templar (or Order of the Temple) was disbanded in 1319, the fortress of Tomar was turned over to the Portuguese Order of Christ, becoming its headquarters in 1357. King Manuel and King João III in the 16th century added extensively to the site making this a very large monastery—the artistic work speaks to the wealth of Portugal as a world power at that time. The monk’s cells were finished around 1543 – 1545, the tiles are from the 17th century. 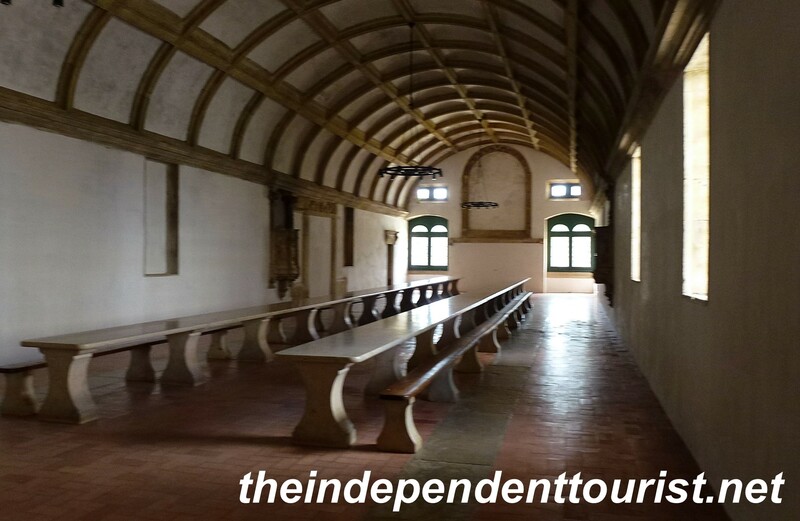 The refectory was finished between 1535 – 1536 by King João III, reserved for reading during meal times. 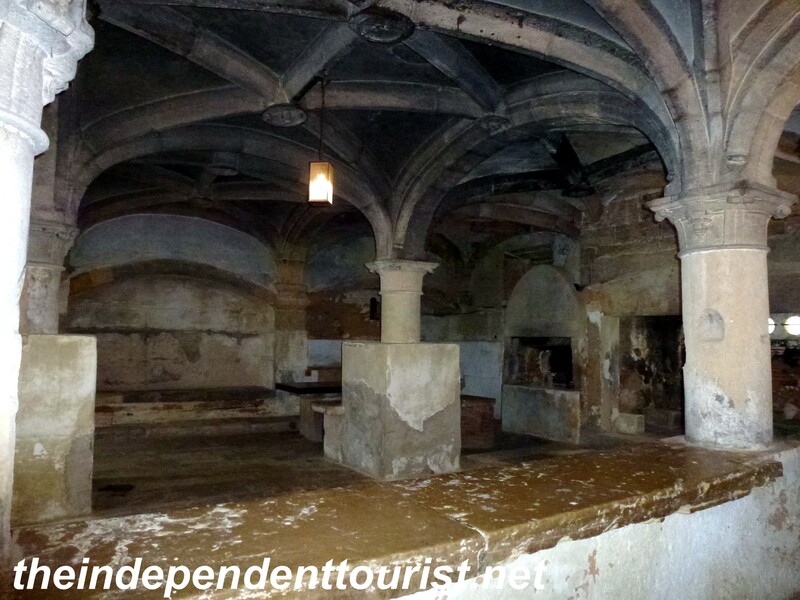 The kitchen of the monastery (16th century). Tiles in the Portocarreiros Chapel, built 1626. 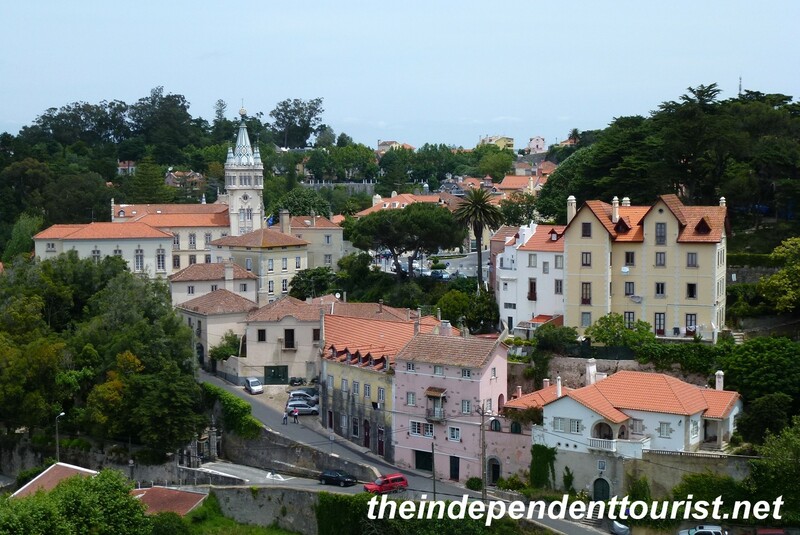 Practicalities: Tomar is an easy day trip from Lisbon. It’s about a 2 hour train ride (€9.75 each way), and the train leaves from Station Apolónia (eastern side of Lisbon). It’s about a 15 minute hike from the Tomar train station up the hill to the Convento de Cristo. The entry fee was €6. There’s a lot to see, so allow at least a couple hours. I kept finding new cloisters (courtyards), rooms, and unique views and architectural features of the buildings at every turn. The signage is comprehensive and in English. If you get hungry, there is a café on the site as well. Be sure to stroll out and see the terraces, gardens, walls and an aqueduct that was built in the 17th century and finally gave the monastery a consistent water supply. Main cloister—started in 1530-1533, under King Joao III (1521-1557), considered a masterpiece of the European Renaissance. References: Signposts throughout Convento de Cristo. 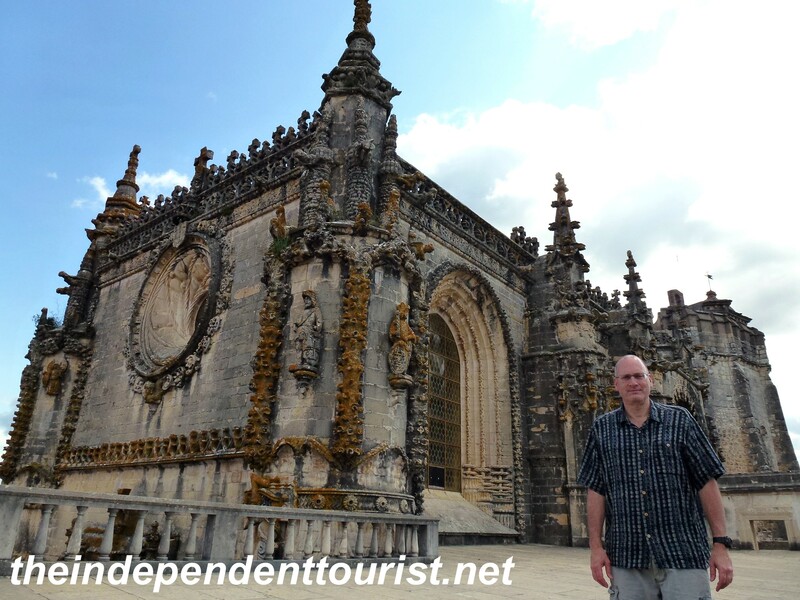 Posted in Portugal and tagged Convento de Cristo, Day trips from Lisbon, Portugal Travel, Things to see in Portugal, Tomar on April 29, 2013 by Paul Terry.